We have developed a new generation of stray line instrument recovery buoys which contain a GPS receiver and a radio modem that allows the buoy to report its position when it reaches the surface. Combined with its bright white led strobe this simplifies instrument location and recovery in most lighting and weather conditions. Upon rising to the surface the buoy assumes its normal non-inverted position and a mercury tilt switch powers up the system. A delay circuit is included to prevent the system turning off again on rough seas.The microprocessor then initializes both radios, transmits the buoy identification code plus an "ON SURFACE" message and attempts to obtain a valid GPS location. At periodic intervals (user configurable- typically 30 seconds) the buoy transmits its identification and location or, if a valid GPS location is not available, the message "WAITING FOR GPS". After a defined amount of time (user defined-typically 3 hours) it may be assumed that the instrument has not been recovered. At this time the buoy enters a power saving mode where it goes to 'sleep' , waking every hour on the hour and transmitting its location for a few minutes before going to 'sleep' again. 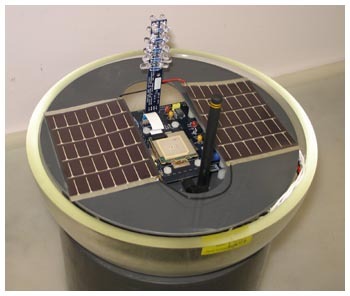 The buoy contains solar panels that are intended to provide enough power to keep the buoy running in this low power mode indefinitely. In its simplest configuration an antenna and radio modem connected to a computer or terminal on the ship can be used to receive the data from buoy. We have however developed a repeater that can be used to retransmit location data from the buoy to mobile receivers anywhere in the ship. This consists of a radio modem, a GPS receiver, and a microprocessor. It may be powered by internal batteries, or low voltage power run from a suitable location on the ship. It is typically mounted close to its receiving antenna high up on the ship (above the bridge house) where it has a good 'view' of the surrounding ocean. This repeater receives GPS identification and location data from the buoy. Then using the GPS receiver inside the repeater it calculates the bearing and distance if the buoy and retransmits this information along with the original buoy and local GPS data. Two types of receivers are used with this system. 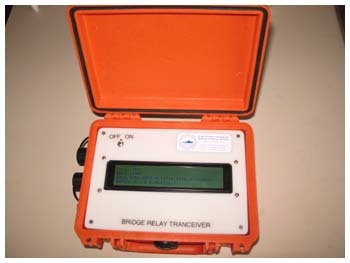 Using a radio modem interfaced to a laptop, it is possible to view and log the recovery data being relayed from the buoy. With the addition of some custom software a graphical representation of the ship's location and the relative position of the instrument is also possible. This requires no additional data as the repeater is re-transmitting the GPS location of the ship, the location of the buoy and its bearing and distance. The handheld terminal contains a radio modem, lcd display, microprocessor and batteries. 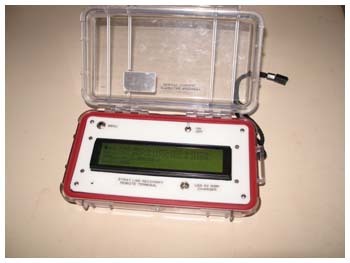 This portable terminal may be used to display data from the repeater. In addition it contains configurable audio and visual alerts to warn of instruments that may have arrived on the surface unexpectedly. The electronics are sealed inside the glass sphere and the process of opening and resealing a sphere can be time consuming with the possible risk of damage. For this reason,one of the design requirements is that the software running the embedded controller can be upgraded without opening the sphere. Using a radio modem and special PC based software, the microprocessor in the buoy can be completely reprogrammed without opening the glass sphere using the radio modem. In addition, there are a number of text commands that may be sent via the radio modem to set user configurable parameters in the buoy. 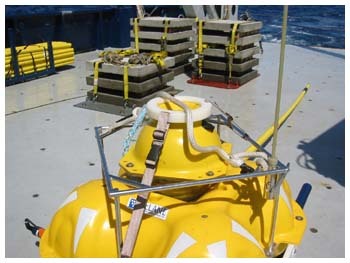 This image shows a strayline buoy (far right) attached by a 30 foot tether (blue nylon rope) to a seafloor electromagnetic receiver (far left). 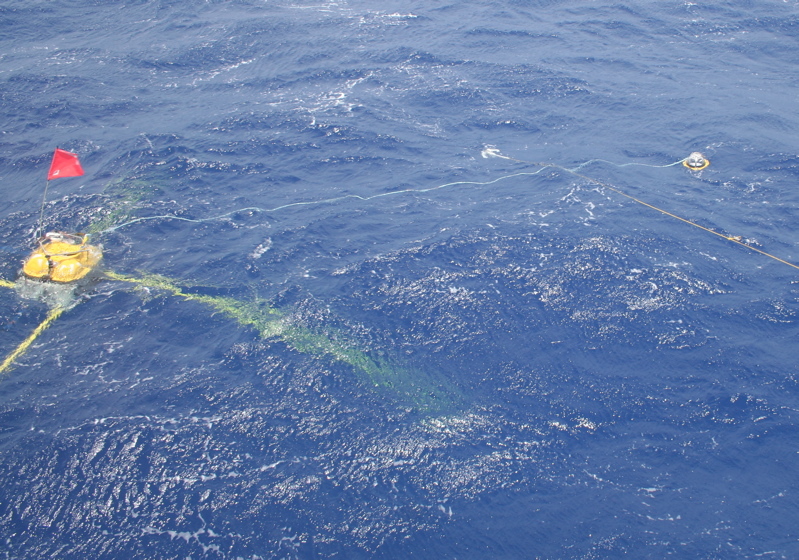 A floating grapnel hook attached to the yellow rope was thrown from the ship over the strayline. The buoy is then pulled aboard the ship, the blue tether is secured to the ship's crane and the EM receiver is lifted onto the ship's deck.